What brand is the washing machine? Sorry I do not have that information. Room dimensions? 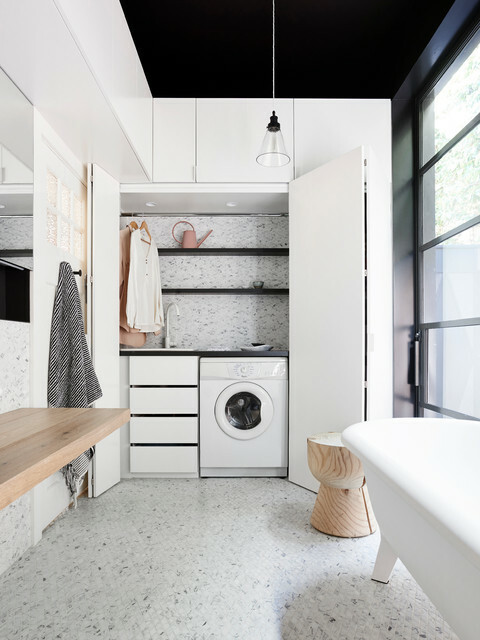 - just wondering what the dimensions of this laundry/bathroom are? For a more compact and functional laundry, bi-fold doors were used to conceal the area. “Concealing the laundry means you can hide all your unruly laundry items quickly and easily.” says Holbrook. Melanie Gardener added this to Where Can I Hide My Laundry? 2. In a bathroomLaundries and bathrooms are both wet zones, so it makes sense to incorporate these two rooms when space is tight. To keep from interrupting the calm, relaxing nature of a bathroom, it’s customary to conceal the laundry in some way – in this case, behind bi-fold doors. The door profile has been cleverly chosen to be in keeping with the contemporary style of the bathroom, yet it is simple enough that it doesn’t stand out as a feature. Simple shelves above and drawers to one side allow the homeowners to keep laundry items close to hand. 1. Location: Toorak, VictoriaWhy we love it: When the owners of this renovated family home were faced with how to combine a bathroom and laundry in one, they decided to conceal their utility space behind a bank of bi-folds. But with its stunning tiled splashback and dark timber shelving that picks up on the black ceiling, we believe it’s beautiful enough to be on show all year round. 3. Choose drawers over cupboardsA humble ergonomic revolution swept through houses across the world when drawers started to replace cupboards in the kitchen, and there’s no reason why our laundries can’t be transformed in the same way. It is much easier to open a drawer and quickly locate what you’re looking for than it is to rummage around the back of a dusty cupboard for the fabric softener.This Toorak home in Melbourne by Northbourne Architecture + Design has cottoned on to this trend in its ‘hidden laundry’, which is concealed from the bathroom by bi-fold doors.Tip: Short on space? Consider using a combined washer-dryer unit.Where can I hide my laundry? 1. Combine your appliancesSome say the jury is still out on how suitable combined washer-dryers are. But regardless of whether you love them or loathe them, no-one can accuse these laundry appliances of being space guzzlers.Most washer-dryer combos accommodate smaller loads than washing machines, so are better for weekenders or households with one or two people. If you have a large family or can easily air-dry your laundry, you may be better off installing a standalone washing machine of similar size and using a retractable clothes line. If, however, you are short on drying space, these dual washer-dryer units can be a godsend. Stunning European Laundry. It is a very functional way to use a laundry and to be well organized when doing it. It is very practical way to store a washing machine and to do the laundry as well mainly when space is limited. The European Laundry allows you to do so. Overall the design is very nice and simple with good choice of furniture and accessories to create a positive vibe in the space.